Saashwathi belongs to a family which has its roots deep in Indian arts. Her grandfather is the renowned personality Late Sri. R. Yagnaraman, who was the legendary Genaral Secretary of Sri Krishna Gana Sabha for over the last 50 years, and is the daughter of Mr. Y. Prabhu, Current General Secretary of Krishna Gana Sabha. She is also a committee member of Sri Krishna Gana Sabha. Saashwathi’s family is deep into the cultural arts especially music and dance. Her gandmother Sri. 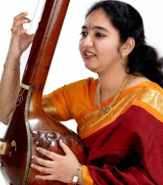 Rukmini Yagnaraman was very good at playing the veena and was a AIR artist when she was young. Saashwathi’s mother Lakshmi Prabhu was a dancer who had given performances in her younger days. Saashwathi’s father Y.Prabhu is also a very good singer, but due to career pressure, could not take up music as his profession. Saashwathi has a deep passion to create music since the age of 13 when she did her first composition on behalf of PSBBSchoolfor Bharathbala’s’ Vande Mataram for India’s 50th year ofIndependence. Since then she has composed many numbers and her major focus is on classical based fusion. Creating music is an expression of the soul according to Saashwathi’s experience. Saashwathi’s passion is to explore Classical music with a touch of fusion so that she is able to present classical music in a modern outfit, and yet without diluting the essence of its deep traditional roots and structure, and most significantly, enhancing the spiritual/devotional essence and nature of Classical music without compromising on the divinity aspect. In her albums, she has worked with many leading and established artists such as Carnatic Vocalist Bombay Jayashree Ramnath, Playback singer Karthik, Playback singer & Bass guitarist Aalap Raju, Violinist Padma Shankar & Guitarist Donan.